We know that you love your dog (or dogs) and are excited about our great all-natural dog treats. We wanted to create gourmet dog treats designed with a dogs health as the primary concern. Also, we needed to make a natural dog treat which would please any dogs palate. Our all-natural wholesale dog treat line fulfills that goal as we provide basic essential nutrition in a fun tasty way. In short, our dog treats are about fun, health, nutrition, and a bit of extravagance. But mostly it's about loving animals and the people who love them. It's what parents have been doing for years with their children... making something that tastes good that is actually good for them. We do that for dogs!! 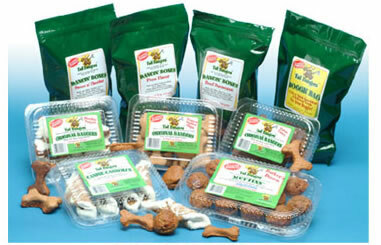 All of our wholesale dog treats are made of all natural, human grade ingredients. There are no byproducts, artificial colors, flavors or preservatives. Our gourmet dog treats are made with 100% whole grains, real eggs, real cheese, real bacon, and fresh ground peanuts. We stand by our products. Because we love animals and we love what we do. We know that you as a dog lover share our vision.